If you are doing email marketing, you must already know that you should build an email list. Money is on the list as email marketing gurus love to say. And it's true. But there is a remark: you have to build your email list and send to your email list the right way, or it won't give you any profit. How do you do that? What is the "right" way to build and send to the list so that it pays off for you in prospect? That is what we will talk about in this article. Before you can send marketing emails, you must have an email list. There are multiple methods to build up an email list. Let's talk about the most common list building methods in order from the worst one to the best one. 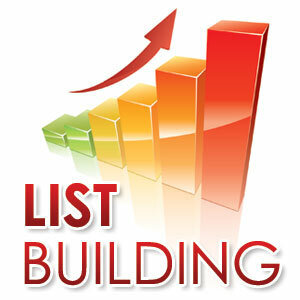 Some marketers do not want to spend time for list building and they buy or rent a list. There are some big problems with a rented or purchased list though. Firstly, how do you know if those email addresses are valid and checked by the users? You can use an email verifier tool to check your list but it won't tell you whether or not your list contains spam traps. Spam traps are always reported as good emails. That is the problem. If you are serious about email marketing, you must avoid getting spam traps on your list by all means. The consequences of hitting a spam trap account, especially if it's a true spam trap (setup by an ISP or anti-spam organization specially to catch spammers), are heavy. Secondly, how do you know if those people actually subscribed to receive marketing emails? You can only trust the selling company but you can never know that for sure. Even if those people subscribed, they did not subscribe to YOUR emails and they did not give YOU the permission to email them. Thirdly, even if all of the emails are verified as good, active email addresses, and confirmed as subscribed, how many people do you think are going to buy something from you? Put yourself into their shoes. Would you buy from somebody you have never heard of? I bet you wouldn't. And I wouldn't. And other people are like you and me. Anyway, renting or purchasing a list is a bad idea. It seems like a quick way to get started, but again it's a bad idea. In either case, you will be sending SPAM. It's illegal in a lot of countries, and it's not very effective. It's still very popular (your spam folder proves that), but not effective. All it will lead to is a lot of trouble. For most beginners in email marketing, this is the best way to build up a list. To motivate people to join your list, give them something valuable for free in exchange for giving you the permission to send them emails. A confirmed opt-in method when the subscribers have to confirm their subscription is better than a single opt-in method because it excludes invalid addresses and collects only the subscribers who are interested in your offer and subscribed deliberately. The subscription method makes sense. People who joined your list are targeted – they subscribed to get the information on a certain topic so you know they are interested in that topic. You are protected legally because you have their consent to email them. The downside of the opt-in method is that you get a lot of freebie seekers. They want what you are giving for free, but may not be interested in buying anything. And some marketers don't use an opt-in list building method because it does not bring a lot of subscribers quickly. However, the majority realize that this method is the best one as it allows to build up a quality targeted list of subscribers and protects the marketer legally. According to MarketingSherpa's "Email Marketing Benchmark Survey" in 2013, "17% of marketers describe their list growth as very positive, growing rapidly. 50% describe it as somewhat positive, growing slowly." Besides that, it's a great way to get started with list building. If you already have a web site powered by WordPress, you can quickly organize the confirmed opt-in process with the free WPNewsman newsletter plugin. Just install WPNewsman and put the subscription widget to the side bar. If you have some offer for your subscribers, you can send the download link in the welcome message they will receive after confirming their subscription. Sending marketing emails to your existing customers is the best way to build up a list. In the United States it is allowed to email anyone whom you have business relationship with until they ask you to not email them anymore. Old customers are best list members because they have already invested money into your product and proven that they are not just freebie seekers. They have a certain trust into your company and getting an old customer to buy again is much easier than getting somebody who are new to your business to buy something from you. So, when somebody buys something from you, you can put them into your email list and send them an autoresponder email series marketing other products or services. Do not forget to include the unsubscribe link into each email to allow them to opt out at any time they wish. With G-Lock EasyMail7 you can easily setup autoresponders and send drip marketing campaigns to your old and new customers. To feel themselves safer, some vendors put the subscribe link on the "thank you" page and then email only to those customers who subscribed. However, according to the US law, they have already given you the permission to email them by buying your product. So, that extra step is not required. If they do not want to receive marketing emails from you, they will simply click the unsubscribe link. So, if you are selling things online and not adding your customers to your email marketing list yet, you are missing a great opportunity to increase your profit. After you got an email list, you can start sending marketing emails to it. The very common marketing method is the pure promotion. This is where you send only promotional messages to your list and no other content. This method works better if your list members are your old customers. They already have some trust into your business and they are more likely to buy unlike people who opted in to only receive some free content from you. The advantage of this method is that it's easy. You can just write promotional emails, setup autoresponders and send promotion after promotion without caring about your list members' troubles and trying to provide some helpful information. From our experience, handling customers' queries and feedbacks takes a lot of time. The "pure promotion" methods frees you from all that work. From the other side, there are two problems with this method. The first problem is that Your list members learn quickly that you are only sending promotions and not providing any helpful content. They learn quickly that you are interested in your success only and not in their and you quickly lose their attention and trust. Thus, you end up with a lot of unsubscribes. The second problem derives from the first one. Since you lose subscribers, you have to continuosly work at growing your list to maintain the level of revenue your list generates. You have to have a quick stream of new members to maintain sales. This method works if you want to quickly hit the jackpot. But it's not good if you aim at developing a long-term relationship with your list members. This method says for itself. You are never sending pure promotions but instead you are sending a lot of great and helpful information to your list. Links to products and services are built in naturally into the message content. For example, if your marketing niche is related to health and beauty, you send a story about how you got your hair thick and smooth and you include links to your products or affiliate products that help you take care of your hair and achieve such an amazing result. This is done naturally. The advantage of this method is a high open rate and long-term attention of your list members. People used to read your emails because they know that every time you send them a valuable information that they can benefit from. The down side of this method is that you cannot make a lot of sales in a short term. You are not focusing people's attention on the offer so it's good if only a few readers click the link and buy the product. To earn a lot of money, you either have to have a very large email list or sell a very high-priced product or monthly subscription. If even a few people subscribe to your monthly plan, you will get sales happening each month automatically. This method combines two first methods. You send a lot of quality information and periodically send promotional emails. From our experience, this method works best. You should build the long-term relationships with your list so you are sending a lot of helpful information and avoiding pitching products or services on every email. At the same time, if you developed or product or stuck upon an affiliate product that has already helped you and you believe it will help your customers, why not promote that product and get them to buy it. There is a remark though: you have to promote those products only that you have tested yourself and found out that they had value. You don't want to lose the subscribers' trust by promoting something that just doesn't work. You have to prove your list members that it actually works, tell about your experience and show the results — all of that is to get them to buy from you now and then. As you know not all products and services will work on all systems and in all environments and not all people are able to setup and use the product properly. There is a risk that some customers won't be able to get the purchased product to work and you will lose a tiny shred of trust from their part. For such cases, make sure that every product you promote and sell is backed up with a money-back guarantee. Will you lose members using this method? Yes, you will but those will be mostly freebie seekers who were not intended to buy anything from the beginning. They are not list members you should cherish to. So let them go. You decide yourself how you build up your list and market to your list. Whatever method you choose, do it. Remember that people subscribe to email lists to benefit from the information they will get. You build up a list and send to it because it makes you sales. It is a win-to-win process. So, take time to build up a list and start marketing to it. But do not send promotional emails to new members right off the bat. Start by sending them quality information and helpful content to build trust and get their attention to every email coming from you. When they trust you, your promotion will perform much much better.